The monochrome trend – what is it and how do you wear it? The great news is this ultra fab, sleek trend couldn’t be simpler! Wearing the same colour from head to toe creates a fashion forward feel that in reality is quite effortless. With a little help, this simple inspirational style guide will have you rocking this trend like a pro in no time! Get the Look: Julia is wearing the It List Sweater (Light Grey Melange, S), Run the World Denim (Grey, 4), One Step Ahead Sneaker (White, 38). There’s just something about a monochromatic outfit that reads cool, collected and a little bit edgy. Choose colours you love that compliment your skin tone or bring out your eye colour. It’s okay to mix in patterned or textured pieces as well! Get the Look: Julia is wearing the It List Sweater (Light Grey Melange, S), Run the World Denim (Grey, 4), One Step Ahead Sneaker (White, 38), Layers of Love Necklace (Silver), Grab and Go Handbag (Black). To achieve an undoubtably chic monochrome look, pair the same colours from head to toe, but break it up a bit by wearing different shades of the same colour. This creates a clean and simple, put together look! Get the Look: Julia is wearing the Find Your Fancy Tank (Ivory, XS), Rock With You Jacket (White, XS), World Class Denim (White, 4). Dressing in a crisp, all white outfit is definitely appropriate for spring! It creates a clean look that just reads trendy! Adding a faux leather jacket is a great way to add some personality and edge to your look. 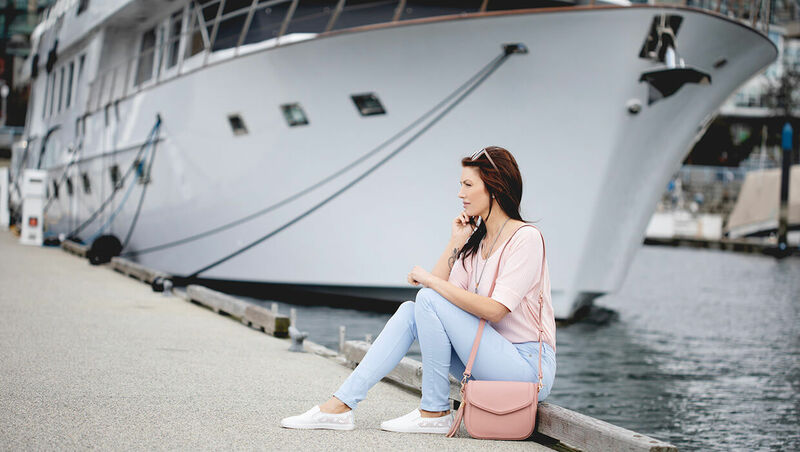 Get the Look: Julia is wearing the Find Your Fancy Tank (Ivory, XS), Rock With You Jacket (White, XS), World Class Denim (White, 4), One Step Ahead Sneaker (White, 38). Incorporating patterns into your new trendy look can make the outfit less uniform and more interesting! Whether it’s with a top or an accessory like a purse or scarf, adding patterns takes your monochrome outfit to another level. Get the Look: Julia is wearing the Out and About Top (Dark Navy Stripe, XS), Swept Away Crop Pant (Dark Navy, S), One Step Ahead Sneaker (White, 38), Layers of Love Necklace (Silver). Dressing monochrome is an easy, new trend to adopt and will instantly set your style apart. There is no need to overthink your outfit as monochromatic looks are always sharp. Remember to mix up the colour hues to break up the uniformity of your outfit. Dressing monochrome is a super easy and fun trend to adopt, so go on and give it a try with give it a try with these items!